Home Blog Paul’s Success Story: $3000+/m. building and selling AliExpress affiliate sites. We are fond of listening to success stories from AliExpress affiliates, especially from our clients who are using websites built with AliPlugin. Today, we would like to share with you the story of Paul who has developed a nice business model to earn with the help of AliExpress affiliate program. Ok, Paul, we’re all ears. Shoot! It’s been already 3 year since I started doing this. At first, it was just a hobby. Some friends of mine asked to give them a hand in creating simple ecommerce sites. Two years ago, I discovered Amazon affiliate program and built 30+ Amazon affiliate stores. It wasn’t that much of a success, but I managed to earn about $500-$700 each month. How did you get started on building AliExpress affiliate websites? When I heard about Alibaba/AliExpress for the first time, I understood that there is a new e-commerce leader in town. I began searching for AliExpress affiliate program on some CPA affiliate networks and found it on Neverblue and CJ. But I was disappointed greatly when I saw what the commission rate was offered. It was only 1% and I decided that it’s not worth the effort. Later, when the official AliExpres Affiliate Program was launched and AliPlugin was released I had no doubts that the right time to start this business had come. From the one hand I had a trusted affiliate program that pays up to 50% commission and from the other hand I got a perfect solution for building AliExpress affiliate stores. How much money do you make from these stores each month? I have two main income streams – from affiliate commission paid by AliExpress and from direct sales of my websites. Here is my commission income breakdown from November 2014 to March 2015: November 2014: $0 December 2014: $153 January 2015: $398 February 2015: $658 March 2015: $818 Besides affiliate commission earnings I get profit from selling ready stores built for AliExpress affiliate program with AliPlugin. In March I sold 27 sites for $2478. How much time does it take you to create one such store? It’s not that hard as it may seem. you just go through several simple steps – get domain name and hosting, setup WordPress, install AliPlugin, select a theme and upload products. I’d say it takes about an hour. Tell us more about your websites. What niches and countries are you targeting? Right now, AliExpres is becoming more and more popular among people all over the world. As for niches, in my opinion, any market is good and it doesn’t depend on the location chosen. But still some countries seem more successful such as Spain, Brazil, Russia, and countries of Eastern Europe. As for niches, the most profitable ones in my case are Electronics, Apparel, Health and Beauty. I also tend to target female audience mostly since it seems to bring better conversion rate. I read that women usually spend 40% more time on social media than men so this is the reason why..
You mentioned social networks. Is it your primary promotion strategy to drive traffic to your websites? You shouldn’t underestimate social media, but most of my traffic – mainly organic – comes from Google. I use a rather simple strategy. I upload around 3000-5000 high-rated products with 3% or more commission rate to each of my web stores. As a result I get many pages indexed by Google ranked with long tail keywords. Do you want to start building such stores yourself and copy Paul’s success? 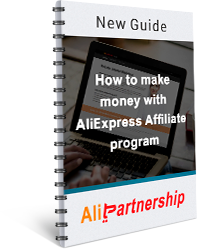 Buy AliPlugin now and create your first AliExpress affiliate store today! Feel free to Contact Us anytime if you need more information.